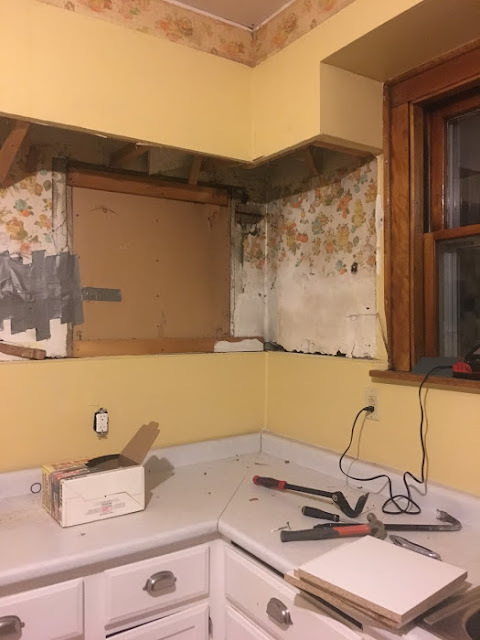 Oh, how I've hated this kitchen. 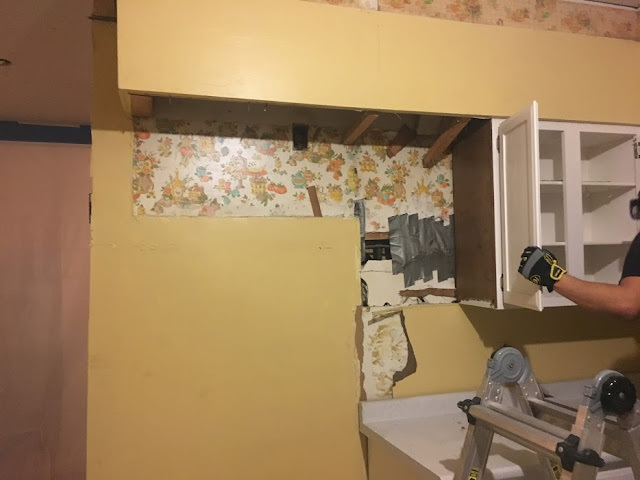 The 1960's cabinets that were literally falling apart. The total lack of counter space. 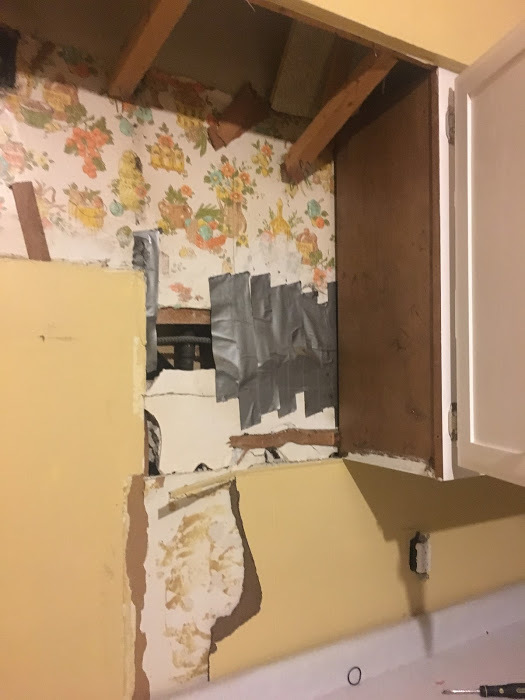 I especially hated the gap, nay the abyss, between the stove and the dishwasher and the stove and the wall. Without fail, food or utensils would wind up next to the stove and I would have to fish items out with a broom. 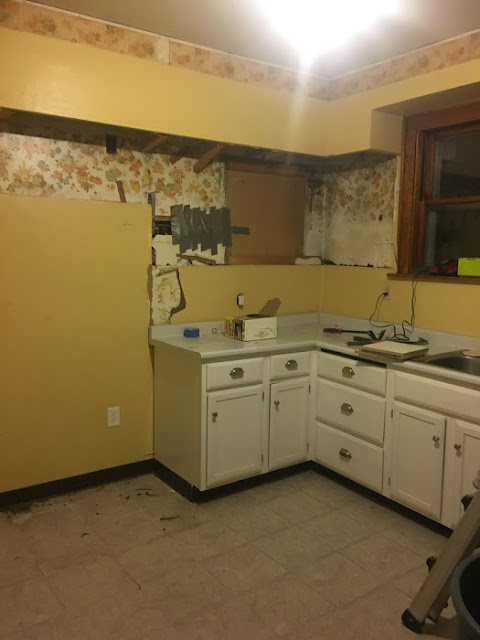 Phase one of demo was easy; we simply unscrewed the cabinets and took them out. As you can see, the kitchen was a hodgepodge of different eras of renovation. Yes, that is original subway tile that you see. No, it was not even remotely salvageable. Let me tell you that demoing it out was a *nightmare*. There was a good three inches of concrete and wire mess holding it in place. We did rent a Bagster for this project. We've used it before and really liked it. It's much more affordable than a dumpster and you don't need a permit. You can pick one up from Home Depot or Lowes and just set it up where you want it (but in an area that can be reached by the truck coming to pick it up). 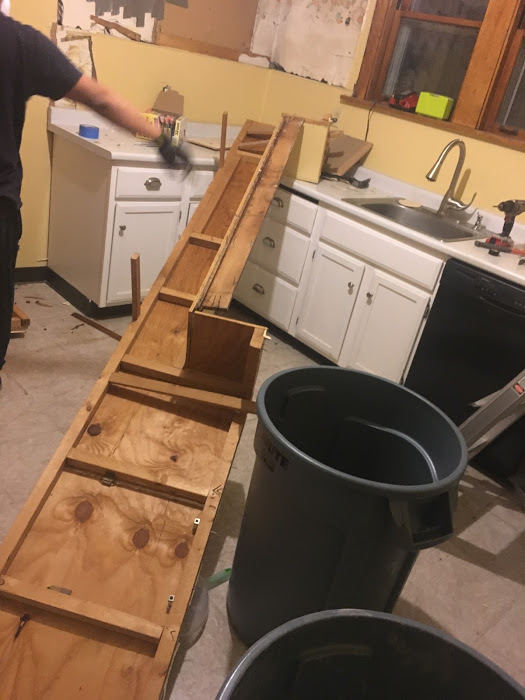 It held our entire kitchen, including ~300 sq. ft. of tile, backer board, and maple flooring (yes, 300 sq. ft. of each of that material, more on that later). You can learn more about Bagster here. As for the cabinets, I didn't feel right smashing them to pieces and throwing them away. While they were not right for my purposes, they were solid wood and could be refurbished for use in another kitchen or perhaps as storage in a garage, workshop, etc. So, we moved them out to the alley with the countertops and old sink and I posted them on Craigslist under the "free" section. They were gone in 24 hours! Score. As for the floor, it was a process... There was cheap ceramic tile over backboard, 60's linoleum, 40's linoleum, and then original maple hardwood floors. I would've liked to keep the maple floors, but it was covered in a questionable black tar adhesive from the 40's linoleum. This substance, and the tile itself, can be asbestos containing. As such, we took proper precautions and removed it all, including the coated wood. That was 5 days of pure hell, in hazmat suits with respirators. We did not take any photos, largely due to how much fun we were having (not) but also because we did not want to breach the containment zone by bringing our phones or camera in and out. Where do we stand now? I'll fast forward through some boring details, but basically, we have all new electrical (including a fun side project to upgrade and replace our electrical panel) and the exterior walls are insulated. Next steps are drywall and subfloor installation! Hi back from the outer edges of earth! Wow have you been having fun!! Hope it's not 2 more years to see progress. Hello! I just read your post on the Ikea vs. Cliq cabinets. Did you decide to go with one of these? If so are you happy? Thank you!